Conflict is by far my least favorite thing about being human. It seems a day rarely goes by without some sort of conflict with a spouse, child, relative, or friend. I am always either in the middle of it, or trying to help someone navigate through it. Regardless of my day-to-day life experiences, I feel I am always wishing I had some professional advice! Dr. Linda Mintle’s new book We Need to Talk specifically addresses How to Successfully Navigate Conflict. Conflict is a normal part of our lives and relationships. But the desire to avoid it and the tendency to handle it poorly can get us stuck- or even in trouble. In this practical and approachable book, therapist Dr. Linda Mintle expertly leads you through successful conflict management so that you can enjoy more secured peaceful relationships. She offers real-world advice based on solid research for marriages, parenting, extended family, ex-spouses, blended families, and friendships. I think the most helpful thoughts on conflict Dr. Mintle offers is the idea that we learn so much about conflict from our parents. For me, looking at my style of dealing with conflict through the lens of my upbringing is enlightening. Clearly, I avoid conflict at all costs, which in the end is expensive. A certified sweep it under the rug kind of girl (the Avoider according to Dr. Mintle), I really enjoyed rethinking navigating conflict. 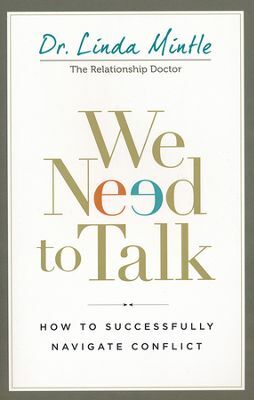 We Need to Talk by Dr. Mintle is informative, helpful, and an easy read. It is full of examples and illustrations to assist all of us in our day to day dealings with conflict. I think it would make a great reference book for any family. I was given a complimentary copy of this book by its publisher in exchange for an honest review. All opinions are my own and I have not been compensated.